Purlift entered the concrete repair industry in 2012, and we have enjoyed great success using the innovative PolyLevel® system. We recently moved to a new building to enable us to fit our growing company and to better serve our customers. We are proud to offer high-quality lifting, leveling, and decorative solutions throughout Greater Montréal. Many people aren’t well educated on PolyLevel® and the benefits it offers. PolyLevel® is a polyurethane foam mixture that is injected under the concrete. Polyurethane concrete lifting is a fast, environmentally friendly, and cost-effective solution to level and stabilize sunken concrete slabs. Our PolyLevel® services have a number of commercial and residential applications, including repairing walkways, parking lots, roads, driveways, pool decks and more. No matter what kind of concrete repair issue you have, we can provide you with a long-lasting solution. When we envision what it means to REDEFINE our industry, we know our impact can be most significant with the customers we serve, the other dealers we work with, and the employees we have the privilege of walking alongside. From the moment you contact us, we will do everything possible to ensure that you have a pleasant, hassle-free experience that results in complete customer satisfaction. If you have any commercial or residential concrete leveling, or lifting issues, contact us today for your FREE no-obligation estimate! 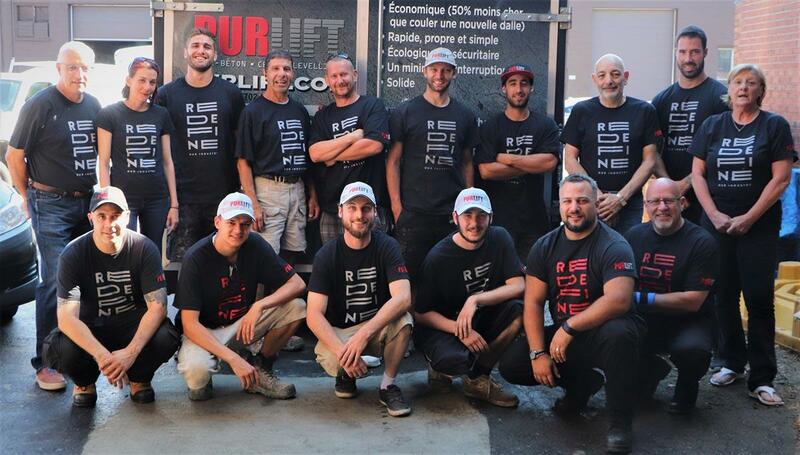 We proudly serve through the Greater Montréal area, including Montréal, Brossard, Laval, Beloeil, Saint-Hubert, Longueuil, Repentigny, Saint-Constant, Anjou, Blainville, and nearby.